The Graduate School provides a walking tour of Purdue’s campus at 2:00 pm on the first Friday of every month. The tour begins at the Purdue Graduate Student Center (PGSC) located at 504 Northwestern Ave. Walking tours at other times can be arranged by calling PGSC at 765-496-0400 or emailing PGSC at pgsc.purdue@gmail.com. Use the calendar (located at the bottom of the page) to select the date of your campus visit. A link to RSVP will appear at the bottom of the page. Click on this to register for the tour. Please be sure you complete the registration form for everyone attending that is interested in graduate school. Where do you live as a graduate student? There are several options within the Lafayette and West Lafayette communities; it all depends on your preferences. If you prefer living closer to campus West Lafayette is a good choice. If you prefer a quieter living situation away from campus then Lafayette is a good choice. Both have plenty of grocery stores, restaurants, and activities. Ask around your department to get a feel for where other graduate students within your program live. How does graduate school differ from undergraduate? Typically in graduate school you are paired with a major professor and work with them on a research project. However, this can vary between department and major. As an undergraduate you are typically saturated with classes, but in graduate school you take fewer courses. This allows for teaching, research, or internship opportunities while in graduate school. How do I meet people while in graduate school? There are multiple ways to meet other people while in graduate school. Within your department you can join your graduate program organization. Also attending fitness classes or club meetings for activities you are interested in, is another great way to meet people. Utilizing the Purdue Graduate Student Center (PGSC) and participating within the Purdue Graduate Student Government (PGSG) is another great way to meet people at Purdue. The Purdue University campus student body, in general, is warm and welcoming. Yes, you can have a car on campus and get a parking pass as long as you live more than 1.5 miles from campus. The parking pass can also be paid monthly out of your stipend or as flat one-time payment. 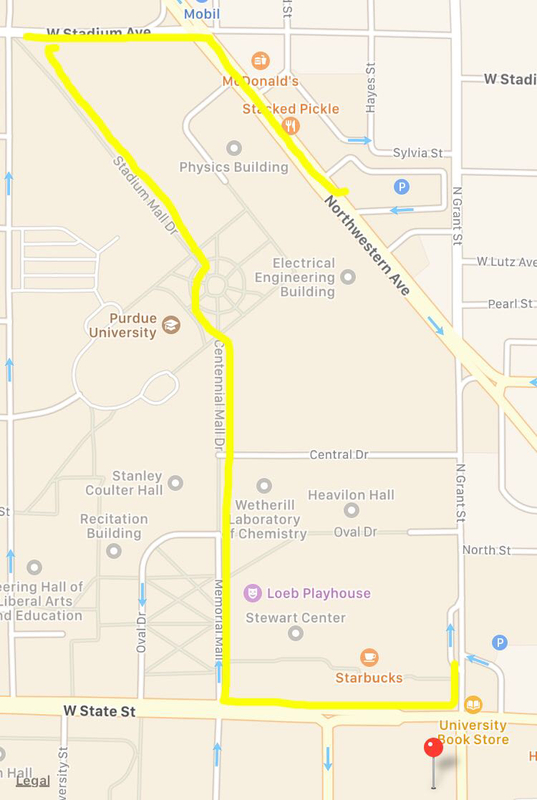 Bus service is free with your Purdue ID and biking is easy with the designated bike lane running through campus. Are there opportunities for travel while at Purdue? Opportunities for traveling are available at Purdue, but they vary based on your department. At Purdue students are encouraged to attend meetings and there are scholarships available within departments and campus wide. Other opportunities exist for traveling such as: practicums and study abroad. Is Purdue University’s campus safe? Yes, Purdue University has a safe campus and has an on campus police and fire department in the event of an emergency. Health services are also available on campus for students. Being vigilant and aware are important in any situation including being on Purdue University’s campus. How do I pick a major professor? Setting up meetings and communicating directly within a department, is the best way to find a major professor. Picking a major professor will vary between departments, but learning more about previous students, current research projects, and availability of funding will help you in your search for a major professor. Also making sure that your style, personality, and goals match your major professor are important.